Bengaluru April 17 (IANS) Anupama Shenoy a former woman police officer in Karnataka has entered politics to become a lawmaker and police politicians who make promises but don t fulfil them. "I have entered politics floated a party to contest in the May 12 state assembly elections and become a lawmaker to police politicians so that they fulfil their promises and fear any wrongdoing " Shenoy told IANS in an interview here. Shenoy 37 a 2010 batch officer of the Karnataka State Police Cadre resigned as Kudligi Deputy Superintendent of Police (DySP) in Ballari district in June 2016 after a spat with a state cabinet minister and a local liquor baron. As Shenoy could not get justice within the administrative system or serve the people to her satisfaction she decided to empower herself by plunging into politics. Though Shenoy floated the Bharatiya Janashakti Congress (BJC) on November 1 2017 she registered it on February 18 with the Election Commission (EC) which allotted it the "lady s finger" (bhindi) symbol on March 15 to contest in the assembly polls and the Lok Sabha elections in 2019. "I am in politics to create a new leadership in the state as the youth in the three main parties have no space to become leaders unless they are wealthy to contest elections " asserted Shenoy. The ruling Congress in the state is being challeneged by the Bharatiya Janata Party (BJP) and the Janata Dal-Secular (JD-S). As a greenhorn in politics Shenoy knows she cannot come to power but wants to get into the political system anyway so as to ensure better governance clean administration and efficient delivery of services to the people across the state. "Our party will contest in about 30 constituencies with seven-eight in Bengaluru three in Vijayapura two each in Bagalkot Kalaburgi Mysuru and Udupi and the remaining in other districts of the state. I plan to contest from Kaup segment in the coastal Udupi district " said an upbeat Shenoy. For the 225-member assembly including one nominated a single-phase polling will be held in 224 constituencies on May 12 with the counting on May 15. "I want to make my party a platform for the youth and anyone committed to changing the political system and serving the people better. Their economic and social backgrounds do not matter " she affirmed. Candidates contesting on the BJC ticket however should have no criminal background or police cases against them and should know to read and write Kannada the state s native language. "As I was in the police department for four years after joining government service in 2012 I am teaching my party members how to police politicians for the good of the people and the state " Shenoy averred. For Shenoy winning in the assembly elections is not as much a priority as establishing her party through the democratic process. She noted that even the BJP had won only two seats when it was formed in 1980 and the grand old Congress took decades to come to power in the past. "We have not formed the party only to contest in the assembly elections but to sow the seeds for its growth in the years to come. We will support any party that secures majority to form the next government in the state " hinted Shenoy. As parties are permitted to spend Rs 28 lakh for campaign in each assembly segment BJC will raise funds from trusts which support new parties financially. "In the long run we want to support candidates who are poor by sponsoring their election expense. We are managing so far with whatever money we have from our sources " said Shenoy. Claiming that BJC was against corruption Shenoy said her party would be transparent pro-women and pro-environment with sustainable policies. "We also want to check the rampant commercialisation of the education and health sectors in the country so that better facilities can be provided to the needy. As people are our kingmakers we have to protect them at any cost " she said. Shenoy left a promising career in protest against harassment by her seniors who transferred her for taking on a liquor baron in the northwest district. "People around me think I should have continued in the high-profile job. But I had to quit as there was no other means to ventilate against my seniors " she recalled. Singling out former state labour minister P.T. 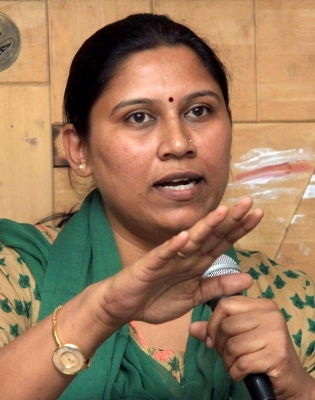 Parameshwar Naik who was Ballari district s in-charge for meddling in her work Shenoy said she had opposed her transfer from Kudligi as the model code of conduct was in force for the local body elections by the state election commission which supported the state government and left her in distress for 10 days. "I have also complained to the Chief Electoral Office not to depute two IPS officers S. Murugan and R. Chetan on election duty as they were my seniors and harassed me on the transfer which was not binding due to the poll code " she reiterated. Observing that it was very hard to be a public servant as politicians force officers to secure money through any means Shenoy said a bad politician and a bad public servant "rot" the system when they were hand-in-glove. For Shenoy the ruling Congress and the opposition BJP and JD-S in the state are alike when it comes to the three Cs -- corruption communalism and casteism. "I think corruption was high during the BJP rule (2008-2013) under the leadership of its chief minister B.S. Yeddyurappa when his government looted the rich mining district (Ballari) with mining baron G. Janardhan Reddy as a cabinet minister. He made politicians believe they will not be questioned " lamented Shenoy. Blaming the Congress government for curbing the state ombudsman s powers to investigate graft cases by setting up an Anti-Corruption Bureau (ACB) with Chief Minister Siddaramaiah as its head Shenoy said the executive wing of the Constitution become a mere political tool in the state. "The state government uses ACB to threaten opposition leaders while the central government uses the CBI and ED against the state government " she added.